Introducing The Radiant Ms. Curie, our first major release since we opened! Discovering Radium is no small thing. Doing it while being a woman in the 1900s is stunning. Being the first woman awarded a Nobel Price is truly radiant. Marie Curie did all that and more. Here, this semi-dry mead does more with the taste of citra hops, moving into a lively oak finish, but with a slight bite at the end. Try some and find your inner glow. Ms. Curie will be available on tap and by the bottle starting Friday. Recently it came to our attention that we had an issue with Spruce Goose refermenting in the bottle, which was causing some corks to pop off and the product to be drier than we wanted. A choice was made to pull the batch. We were able to look up everyone who bought a bottle and reached out to as many as we could to alert them and make amends. 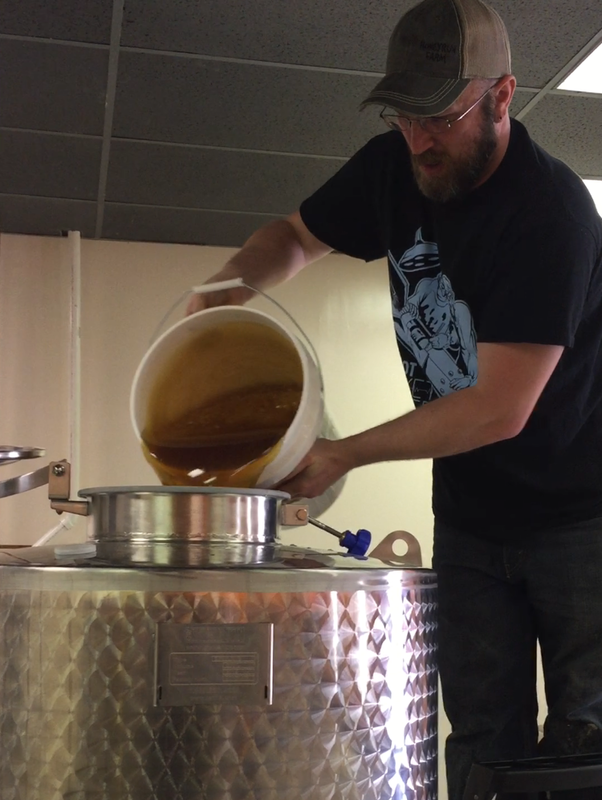 We also took a hard look at the step by step process we use here to make the mead. We wanted to be sulfite free from the start, and designed our processes towards that end. I'm sorry to say that just can't happen right now. We have made the call to start sulfiting our product to ensure that it is stable and free of issues going forward until our process gets to a point where we can safely say it is stable. This we hope will be not forever. Many of our patrons were very happy to hear we were sulfite free. We wanted to reach out to everyone with this change proactively so you can know what you are drinking. We will be closely monitoring our levels to make sure we are useing a correct amount in our products. From Jenn and I thank you everyone for understanding and for supporting us opening and moving forward. If you have any questions please feel free to reach out to us. Love this article, it talks about our healthcare backgrounds. Check it out! Columbus Underground interviewed our Meadmaker! Great story that covers our origins and how we choose our names. Click here to read. It's summer already! May has been a very busy month for us here at Uprising, with the big news being that we are finally FULLY LICENSED! We started production on our first four meads this month, which will be the ones we open with in August. Taking our production from 20 liters to 600 has been a challenge for sure! Luckily both nurses (Jenn) and paramedics (Nate) are experts at the art of improvisation and “MacGyvering” solutions, so we're still trucking along with relatively minor losses along the way. On the construction side of things, we're still working on the tasting room. This month will see the bathrooms and foyer renovated, and the bar and tables built. Our kegerator has already arrived and we can't wait to get it set up and ready for action! Now for the deals! We're offering two limited opportunities to get in on all the delicious mead action. First is our mead membership. This is a quarterly club that delivers three bottles of mead to your door. This will include some very limited editions, so this is your chance to get bottles set aside for you before they're even released. We have to start small with this until our production can scale up, so we're limiting the number of members. The second opportunity is the Founder Club, detailed on the right. Please click here for full details on both offerings. Here we go! Uprising Meadworks is pleased to announce that we are fully licensed and have started our first batch of mead! We are planning our grand opening on August 3-4, which coincides with National Mead Day! This journey has been the most difficult thing either of us have undertaken in our lives, but it has also been 100% worth it. We are so excited to be able to share our mead with you. Nothing makes us happier than watching someone have their first taste, and seeing the look of pleasure on their faces. We have learned so much about the business of producing alcohol, and look forward to learning even more, and we're so happy to share this experience with so many of you. Your support and encouragement have been invaluable to us and for that we say THANK YOU! We are pleased to announce that after a few months of delays, we are finally making progress on our build-out! We're in the midst of getting plumbing installed, the drains are are in, concrete is poured, and the final touches on the walls are being done next week. The next step is to get our final plumbing inspection and then the state ABC (Alcohol Board of Control) comes out for our State winery license inspection. If all goes well (fingers etc. crossed please) we'll be ready to produce by April 15th! Thanks to everyone for their support, encouragement and PATIENCE during this process. We've got some great stuff planned, so keep watching for updates.